I was tremendously glad to get your letter, thank you for it, and for the 50-Fr. note. Congratulations on Tersteeg's letter, I think it is absolutely satisfactory. I am certain there is nothing to be hurt about in his silence with regard to me; besides, he could count on your giving me his letter to read. Then too, it is much simpler for him to have only you to write to, and as far as I am concerned, unless he thinks my stuff hopelessly bad, you'll see that he'll write me a line as soon as he has seen what I've done, I tell you again, I am more pleased with this simple and well meaning answer of his than I can say. You will have noticed that he says he is prepared to buy a good Monticelli for his own collection. What if you were to say to him that in our collection we have a bunch of flowers which is a better piece of painting and more beautiful than one by Diaz? That Monticelli sometimes made a bunch of flowers an excuse for gathering together in a single panel the whole range of his richest and most perfectly balanced tones. And that you must go straight to Delacroix to find anything equal to his orchestration of colours. Also that - I am speaking of picture in the Delarebeyrettes - we actually know of another flower-piece, very good in quality and reasonable in price, and that we think it altogether superior to the Monticelli figure paintings which are to be seen everywhere now, and which belong to his period of decadence. I hope that you will send him Gauguin's fine marine. But how glad I am that Tersteeg should have written like this! When you are writing him, you might mention Russell. When I write Russell myself, I shall talk to him about his pictures and ask him to exchange one with me, because we shall want to mention his name and show his pictures as soon as the question of the modern renaissance school comes up. I have just finished a group of apricot trees in bloom in a little orchard of fresh green. I've had a setback with the sunset with figures and a bridge that I spoke of to Bernard. The bad weather prevented my working on the spot, and I've completely ruined it by trying to finish it at home. However, I at once began the same subject again on another canvas, but, as the weather was quite different, in gray tones and without figures. It would not be a bad idea for you to send Tersteeg one of my studies: would you say the bridge at Clichy with the yellow sky and two houses reflected in the water? - or the butterflies or the field of poppies, for that matter, though I hope to do better here. If you think so too, you might tell Tersteeg that I myself thought I should have a greater chance of selling in Holland with nature studies of the Midi, and that when Tersteeg comes to Paris in May, he will find a consignment of several subjects from here. Thank you very much too for all the steps you have taken toward the exhibition of the Independents. On the whole I'm very glad that they've been put with the other impressionists. But though it doesn't matter in the least this time, in the future my name ought to be put in the catalogue as I sign it on the canvas, namely Vincent and not Van Gogh, for the simple reason that they do not know how to pronounce the latter name here. 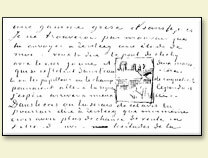 I return to you enclosed Tersteeg's and Russell's letters. It might perhaps be interesting to keep the artists' correspondence. It would not be a bad idea to add the little head of the Breton woman by friend Bernard to your consignment. He must be shown that all the impressionists are good, and their work very varied. I think our friend Reid regrets having fallen out with us, but unfortunately it's quite impossible to offer him the same advantages again, or to try to let him have the pictures on commission. It is not enough to be fond of pictures, and he seems to me to have no feeling for artists. If he changes as much as all that, it will not be overnight. Tersteeg was a personal friend of Mauve's and of many others, and there is something about him which convinces collectors. You will find that knowing people is what gives conviction. I'll write again in a few days, but I wanted to congratulate you at once on the rebirth of your business relations in Holland. Paris doesn't pay: I'd be sorry to see the Seurats in a provincial museum or in a cellar, those pictures ought to stay in living hands - if only Tersteeg would…If three permanent exhibitions are started, there must be one great Seurat in Paris, one in London, and one in Marseilles. Vincent van Gogh. Letter to Theo van Gogh. Written 24 March 1888 in Arles. Translated by Mrs. Johanna van Gogh-Bonger, edited by Robert Harrison, number 471.